The Win a Case of Scotties Sweepstakes is open to legal residents of and currently residing within the 50 United States and the District of Columbia, who are 18 years of age or older. The Win a Case of Scotties Sweepstakes ends on February 7 at 11:59:59 p.m. ET. To enter, log on to scottiesfacial.com/win and follow the on-screen instructions to submit an entry. Limit one (1) entry per person/household per day. 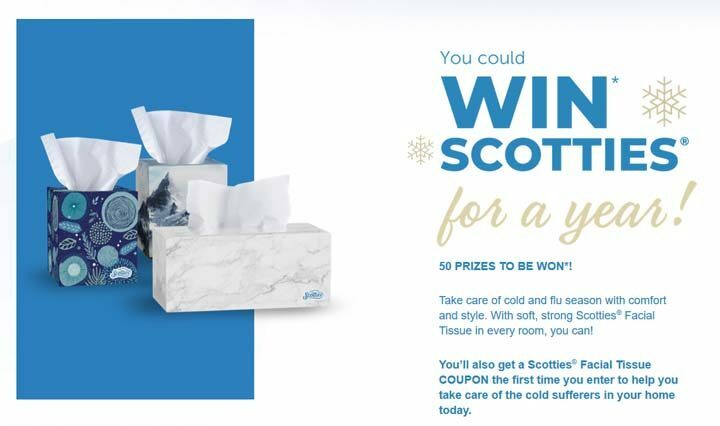 Each prize winner will receive a year’s supply of Scotties facial tissue consisting of thirty-six (36) boxes of Scotties 64-count 2-ply Facial Tissues. ARV: $45.00 each. Total ARV of all Prizes: $2,250.